Keep a delicate symbol of everlasting love close to you with this luxurious wedding ring, marked by a row of diamonds in 18ct White Gold for a uniquely opulent treasure. 18ct White Gold Diamond Claw Set Wedding Ring is rated 4.1 out of 5 by 8. 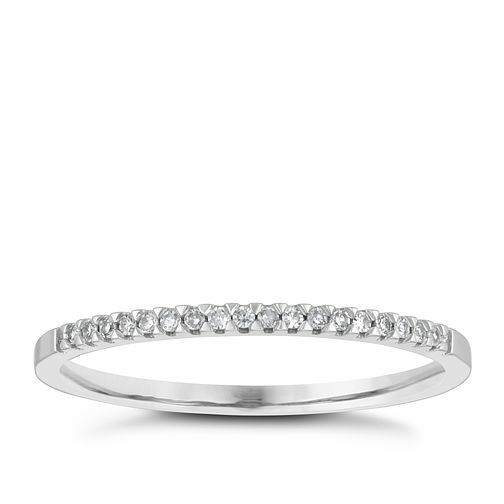 Rated 5 out of 5 by Anonymous from Stunning ring Fell in love with this ring as soon as I saw it and it fit perfect... i didn't know my ring size but with the help of Ernest Jones ring size guide i got the perfect size. I was very fortunate to get in the sale at half price... bargain! I wasn't sure if it would be very thin looking at the photo online but it isn't and so glad I took the risk! Goes perfect with my engagement ring too! Delivery was quick and was kept informed of delivery date.